One sparkling summer day, Jill Abramson brought home a nine-week-old golden retriever named Scout. Over the following year, as she and her husband raised their adorable new puppy, Abramson wrote a hugely popular column for The New York Times's website about the joys and challenges of training this rambunctious addition to their family. Dog-lovers from across the country inundated her with e-mails and letters, and the photos they sent in of their own dogs became the most visited photo album on the Times's site in 2009. Now Abramson has gone far beyond the material in her column and written a detailed and deeply personal account of Scout's first year. 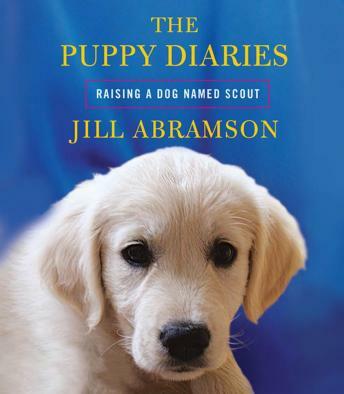 Part memoir, part manual, part investigative report, The Puppy Diaries continues Abramson's intrepid reporting on all things canine. Along the way, she weighs in on such issues as breeders or shelters, adoption or rescue, raw diet or vegan, pack-leader gurus like Cesar Millan or positive-reinforcement advocates like Karen Pryor. What should you expect when a new puppy enters your life? With utterly winning stories and a wealth of practical information, The Puppy Diaries provides an essential road map for navigating the first year of your dog's life. What a waste of time. I finally gave up by about disc three. This author reminds me of a politician - has no clue how entitled she lives. Although she strongly supports dog rescue, it seems to be the responsibility of other people. She has a good reason why she should purchase a purebred, and oh wait, she makes sure you understand that she chose a responsible breeder to purchase the dog with champions in her pedigree. She is so busy patting herself on the back for being such a loving pet owner that I can't imagine her arm isn't broken. Also, her daughter, who is "pre-med at Columbia" is "casually" mentioned several times. Pat, pat, pat. Her sister is an author of children's books with the name Fancy Nancy in various titles. Pat, pat, pat. She and her husband have a "country" home in Connecticut and an apartment in Manhattan. Pat, pat, pat. Tiresome name, dropping throughout as much of the book as I could take. Pat, pat, pat. The woman is clueless.